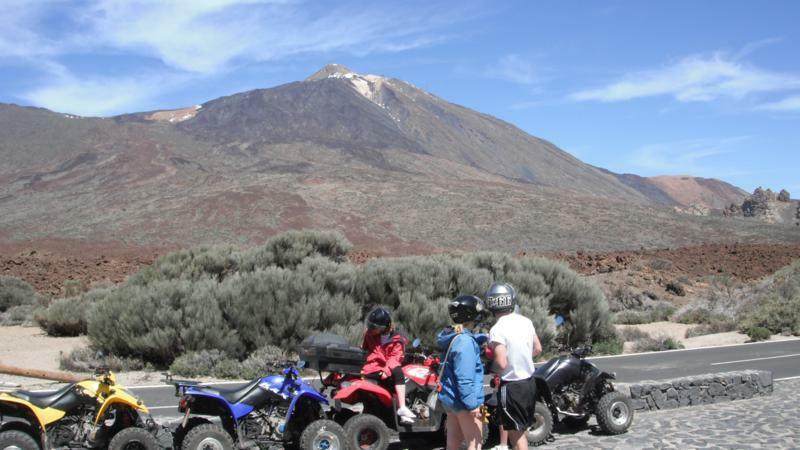 The longest Quad Safari trip, starting from the shore and going above the clouds to the foot of the Mount Teide through the National Park and pra-historic crater. Prerequisites: 18 years old for the driver. Driving licence is required for driver. Discover the areas of middle and high mountains and the place most visited in Tenerife, las Cañadas del Teide. Free-of-charge Pick Up and Drop Off service from and to any hotel in South Tenerife. In the case of any questions, please, feel free to contact us. The TEIDE TOUR Quad Safari took place daily, the time will be specified in your ticket.The stuff speaks different languages. In order to make your booking of TEIDE TOUR Quad Safari in Tenerife easy and comfortable Tenerife Host use the most advanced and user friendly booking platform TripsPoint.com where you can easily check last actual prices, the tour availability, required booking deposit and book this tour. To get more information of TEIDE TOUR Quad Safari in Tenerife and do booking, please, click the button ‘Book Now’. You will be taken to the tour page at TripsPoint.com where you can easily book the tour. 99% of questions Travellers having before the booking are naturally disappearing after you’ve got the tour Voucher. For the other 1% you can use TripsPoint Messengers allowing direct communication after the booking is made. Once the booking of TEIDE TOUR Quad Safari in Tenerife made at TripsPoint you will get your tour Voucher / booking confirmation with all details, including exact pick-up point, pick-up time, pick-up point map. The price include Bus Transfers from and to your hotel in Tenerife South Zone.